This webinar was held on 31 May, 2018. While there is much research and action focusing on the gender-energy nexus in rural settings, there is often very little discourse on addressing gender-related energy challenges specific to urban settings, such as the gender-differentiated access to services, connections and transportation. Mariëlle Feenstra, University of Twente. Presentation: Gender and energy policy in the urban context. This presentation will introduce the challenges and opportunities in access to energy in urban settings and include a reflection on how energy poverty affects women in developed and developing countries. David Mann, USAID. Presentation: Gender considerations in the readyboard electrification demopilot. This presentation will include the gender perspectives the USAID Majestic Gardens project, which provides formal energy access to urban households in Kingston, Jamaica. Claire Baker, LivelyHoods. Presentation: Building a women-powered sales network of clean energy products to serve markets in Nairobi urban slums. This presentation will explain the “hub-and-spoke” distribution model and highlight the results of LivelyHoods established door-to-door distribution network of youth and women from slum communities that brings clean energy products to improve the health and quality of life in these communities. Nthabi Mohlakoana, University of Twente. Presentation: Productive energy uses of energy and gender: the informal food sector in Rwanda, Senegal and South Africa. This presentation will present the findings of recent research on the influence of energy use and the gender dynamics that surround women and men owned food enterprises in the informal sector of three African countries. Advancing Gender in the Environment (AGENT) is a ten-year Public International Organization (PIO) grant to the International Union for Conservation of Nature (IUCN) that was established in 2014 and is managed by the Bureau for Economic Growth, Education and Environment’s (E3) Office of Gender Equality and Women’s Empowerment. 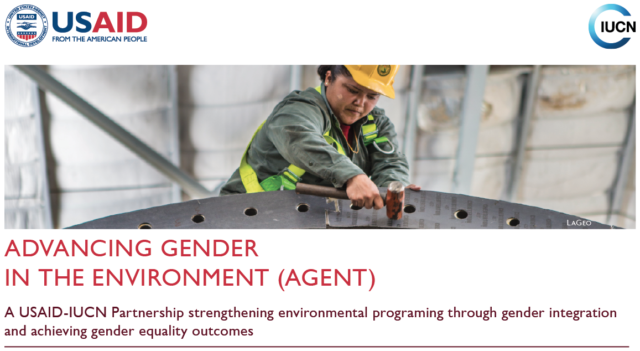 The purpose of the grant is to increase the effectiveness of USAID’s environment programming through the robust integration of gender considerations, improving gender equality and women’s empowerment outcomes in a broad range of environmental sectors.